Shimano Forcemaster 9000 & PE Line set with best price! We are selling this reel to our customers and they are very satisfy with this powerful new reel. 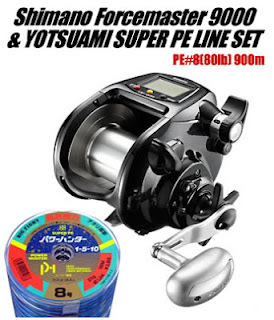 This month, Tackleumi offer new set for this reel "Shimano Forcemaster 9000 & Yoz-Ami power Hunter PE#8 900m" for our cusctomers. Yoz-Ami Power hunter is Japan made PE line, High grade & High quality P.E.line, made of 100% Super-Dyneema = advanced technology's super-fiber.